One of the largest full-service solar companies in the U.S., Sungevity is a trendsetter. Since 2007, they’ve helped homeowners and small businesses navigate the burgeoning industry. They shepherd clients through the entire process of going solar: from design and permitting, to installation and maintenance. As a B Corp, Sungevity is committed to social and environmental responsibility. “We’re trying to do the best for the community and our employees, as well as the environment and our shareholders,” says Dermot Hikisch, Sungevity’s Director of Corporate Services and Sustainability. Hikisch also explains that the company has a “deep focus” on technology. With headquarters in Oakland, that makes sense. “Being here in the Bay Area,” Hikisch says, “we think of ourselves as much as a software company as we are a construction company.” As part of Sungevity’s forward-looking approach to technology, they started exploring digital office check-in a couple of years ago. They faced the challenge of finding a strategy that would work for multiple buildings—two in Oakland and one in Kansas City. “We were looking to cater to all our facilities,” Hikisch says, “and also help improve the overall experience of access for our guests.” At the end of their search process, they decided on The Receptionist for iPad. Hikisch explains that they chose it from among other options because of its user-friendly interface and client support. “What I really like about The Receptionist for iPad is that the user interface is very intuitive, and it provides a positive experience,” he explains. “The team behind it is fantastic—receptive to user feedback and always thinking about how they can make the product and the platform better in the future.” Now all three of Sungevity’s locations use The Receptionist for iPad, and Hikisch says they’ve seen multiple benefits in efficiency. They no longer need a full-time receptionist at the front desk. That position has now evolved into a more cross-functional job that helps out wherever needed in the office. This change not only boosts productivity, but also provides cost savings. Deliveries have been streamlined. When delivery personnel arrive, they automatically connect with several Sungevity team members at once. Whoever is closest can then pick up the delivery in a timely way. In addition to efficiency gains, The Receptionist for iPad helps mitigate security risk. The Receptionist for iPad helps validate people coming into the building and includes services to expedite non-disclosure agreements when needed. Sungevity has enabled an interviewee tab on the interface and integrated an NDA into that tab. Now every interviewee must sign an NDA at check-in and Sungevity has an immediate record of it. Hikisch says, “Sungevity has an active recruiting department. The Receptionist for iPad makes this process more efficient and seamless for candidates and our People Team, and reflects Sungevity’s adoption of technology to help scale the business.” Beyond information security, there’s also the issue of office safety and security. Hikisch notes that being able to know exactly who’s in the building is important for general security monitoring, and especially in case of emergency. 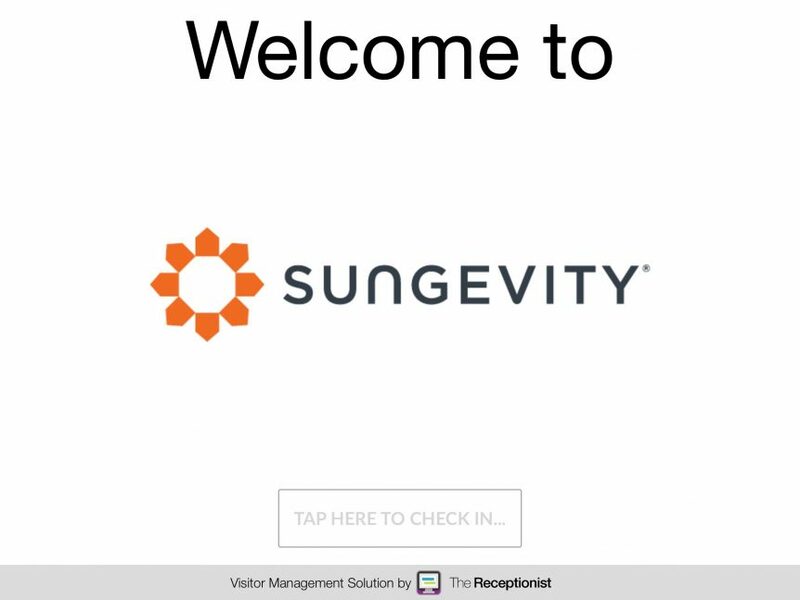 Sungevity, like the solar industry, is always evolving, and The Receptionist for iPad will be there to help. We love to cheer on our clients who are doing good work, and we’re proud to be a part of their success!